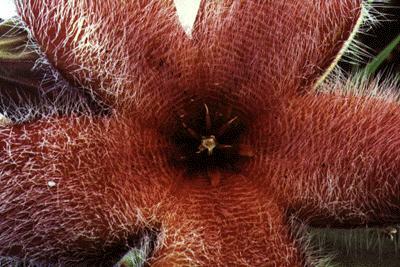 The genus Stapelia comprises a challenging and rewarding group of some 50 species of clump-forming stem succulents from Southern Africa. 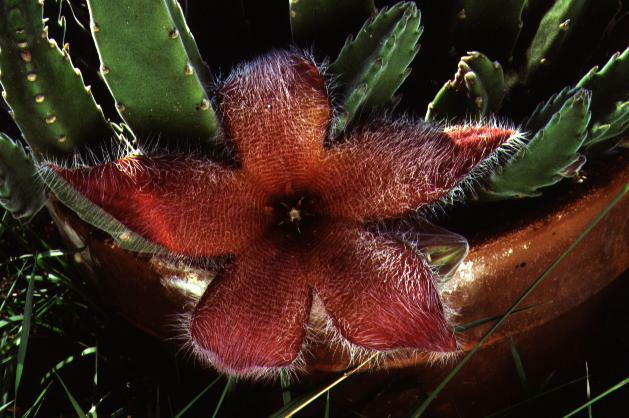 The genus Stapelia has been reduced in scope somewhat by transfer of Asian and South American species to other genera. 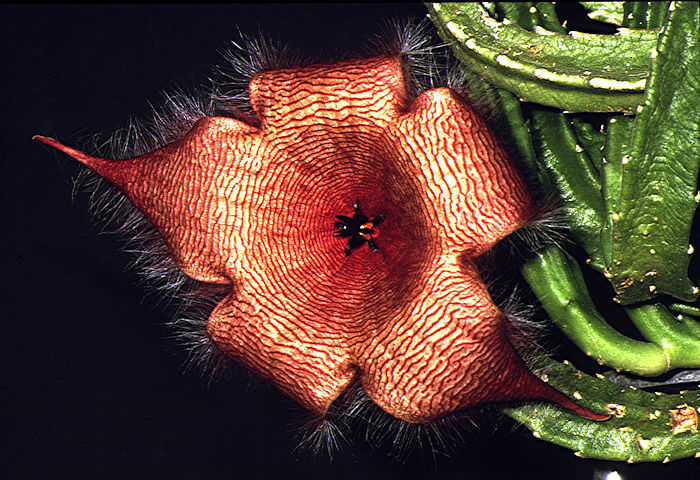 Stapelia was historically merged with Orbea. Leach (1975) re-separated Orbea. into its own genus. 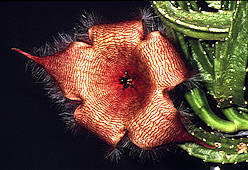 Stapelia stems are leafless, four-angled with toothed edges and may be pubescent. Stems grow erect, branching mainly from the base, and may develop a reddish colour in strong sunlight. 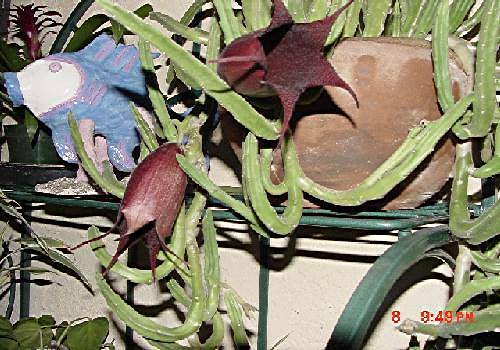 Stapelia have unusual, often large five-lobed flowers, which may be red, purple or yellow, often with interesting banded patterns. The surface can be brightly polished or matted with hairs, and most species produce a putrid odour of rotting carrion to attract blow flies as pollinators. 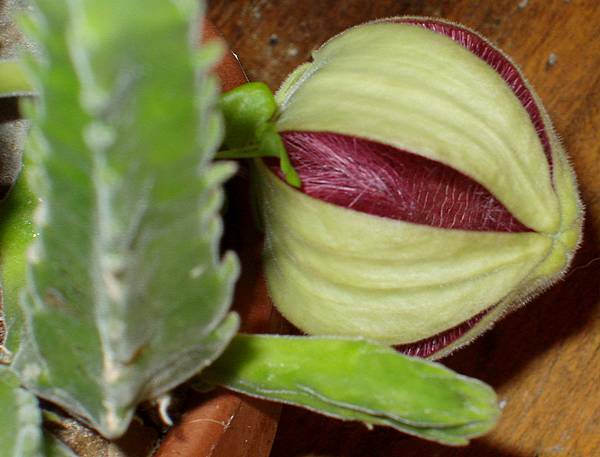 It is common to see a blow-fly (green-bottle) on a Stapelia flower and they often lay their eggs in the centre of the bloom. This explains their popular name of "carrion flowers". S. erectiflora and S. flavopurpurea have sweetly scented flowers. Stapelias grow well and are often seen as window-ledge plants. However, it is important that they are sparingly watered and planted in a very freely-draining potting mix and given plenty of diffuse sunlight as otherwise they are prone to disintegrate into a heap of rotten stems. A minimun Winter temperature of 50°F is tolerated if kept bone-dry. As with other Stapeliads, they are prone to attack by mealy bugs and root mealy bugs. The erect succulent stems are 4-angled with toothed margins, forming 4ft clumps. 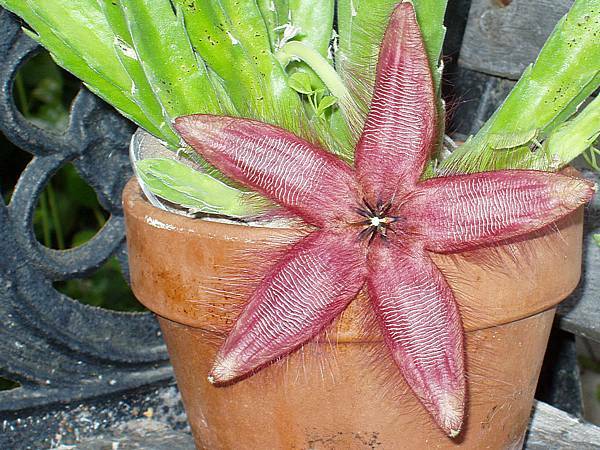 In Summer large (14 in diameter) star-shaped 5-petalled flowers are produced.The yellowish petals are marked in various proportions with embossed red lines and have a fringe of silky white hairs. The flowers produce a perfume of rotting flesh to attract their blowfly pollinators. Native to South-Eastern Africa including Botswana, Malawi, Mozambique, South Africa, Zambia and Zimbabwe. This must be a popular house-plant, to judge by the number of queries received about its identity. It has received the Royal Horticultural Society's Award of Garden Merit. This Stapeliad has quadrangled succulent stems with toothed margins forming clumps up to 3ft in diameter. 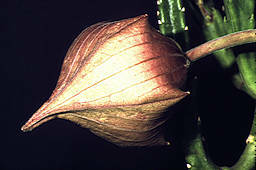 The stem surfaces are slightly concave especially when the plant is dry but expand when water is taken up. Buds are produced from the base of the stems. The somewhat variable, large 5-petalled flowers are patterned with more or less amounts of reddish and yellowish ridges, matted to a variable extent with white hairs and producing a foetid perfume of rotting carrion. The petal margins also have white hairs. 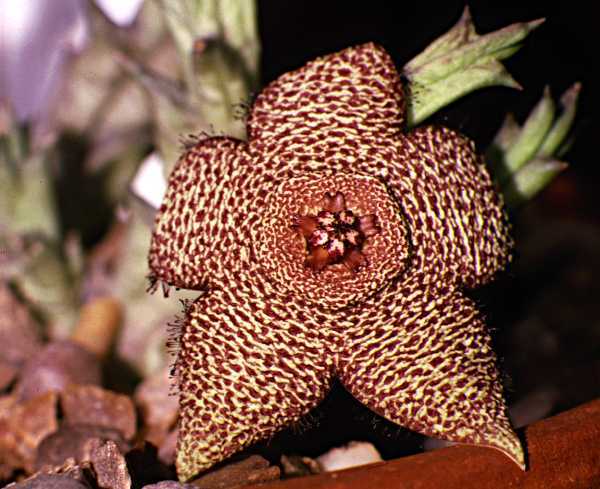 This very variable stapeliad has quadrangled succulent stems and very hairy flowers whose petals are marked with reddish and yellowish lines. Native to the South-Western Cape Province of South Africa. Named for: Miss Reino Leendertz, botanist at the Transvaal Museum who collected this species. The long, angular stems are a dull, dark green. Flowers produced low down on the stems are dark red to purple bells, with the petals fused except at their tips. Native to mountains of Swaziland and tolerates some frost. The succulent stems are light green and toothed. The five-petalled yellow and brown flower is quite variable in the extent of each colour. This succulent plant was raised from seed in the Imperial Garden of Vienna, and is unknown as a wild plant. 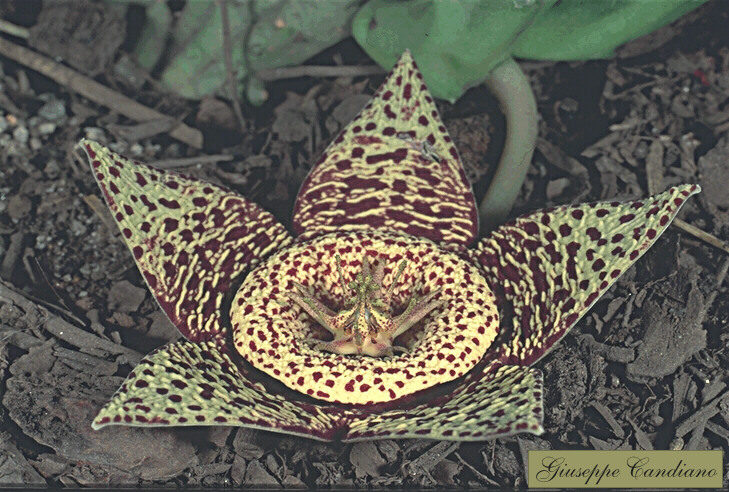 It is likely a hybrid with Stapelia revoluta as one parent. The red and yellow-lined petals are fringed with dark hairs. 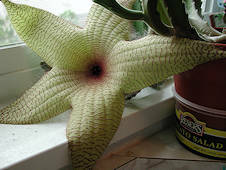 Several species are fairly easy to grow and Stapelia (Orbea) variegata is a well known cottage windowsill plant. Others, often those with slightly hairy stems and the more unusual flowers, are more challenging and require careful watering (with some fertiliser) during the growing season and complete withdrawal of water during the winter months. A minimum winter temperature of 50°F is acceptable, providing that plants are kept absolutely dry. A heated growing bench or incubator may help delicate plants to get throught the colder months. Many species live under shrubs in habitat and prefer light shade rather than full sun. A gritty compost is essential, and clay pots are advisable for the more delicate species. Some growers prefer a mineral-only compost to minimise the chance of fungal attack on the roots. A layer of grit on the surface of the compost prevents moisture from accumulating around the base of the stems. Keeping Stapelias and their roots free of pests such as mealy bugs is the real key to success as fungal attack often occurs as a result of damage to stems by insects. Watering with a good systemic insecticide such as those based on imidachloprid should help to keep plants healthy. 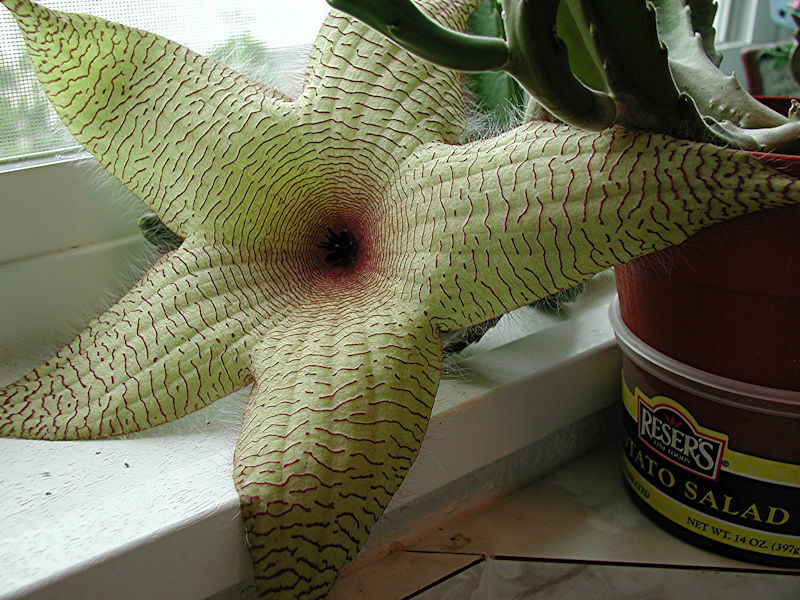 Stapelia gigantea does quite well indoors or under glass in the summer in Vancouver. The stems reach about nine inches tall and just over an inch thick. My plants begin budding in mid-June and are in bloom from early July to the end of August. Water them well in hot weather and extra just before the flowers open, but keep them partially shaded as they tend to scorch. The flowers are about 8 - 10 inches across, densely covered in pink hairs, and smell like very stale chicken meat. They are light yellow with many concentric pink lines. The overall look is very fleshy. My plants are resistant to rot, but (of course) prone to mealy bug infestation. On the first day of every second month of the growing season, I treat them with Malathion as a preventative measure. Stapelia leendertziae also does very well in Vancouver. The stems are more slender than S. gigantea, and slightly taller. My plants flower in August with very large bell-shaped blooms. They are usually about 3" deep and 5 or 6" across. These are very dark red, almost a claret colour and smell like an open drain, somewhat stronger than S. gigantea. Again, they like a fair amount of water in the summer and even throughout the winter, though only about a third from mid-November to early March. A S. grandiflora, grown from IAS seed about 5 or 6 years ago, flowered for the first time 2 years ago with just 2 flowers in October '94 just as the weather went bad. That year it was on a bench at the bottom of my tiny garden getting the sun from about 2 pm till 7 pm. Last year (1995) I put it into a 12 inch clay pot in July and hauled it up the allotment which is on a SE facing hillside and gets full sun from dawn till about 6.30 pm. It was completely in the open and had no shade at all until the sun had disappeared behind the hill. No glass or anything on it, and while it was flowering I gave it a regular dose of tomato feed to help it along, but then it was one of those summers! The pot was half sunk into the clay and it got a watering every day as I was over there every day... I also had a record crop of courgettes too.... It started flowering in august and continued until November when I dragged it back home, having produced between 2 and 3 dozen flowers in all. Alas no seed of course, but I have since acquired some more seed, which maybe in a few years time may give rise to some seed with any luck. There was no shortage of flies laying their eggs on the flowers and I also noticed a number of smart spiders hanging around in a suspicious manner too. The poor plant is currently in my upstairs hallway looking rather sorry for itself, and like me awaiting a return to warmer weather.